Reality: This is simply not true. As soon as a woman becomes pregnant permanent changes occur in her breasts. Even if she doesn't carry to term, or chooses to abort, her breasts will never be the same as they were before she became pregnant. Whether or not she then goes on to breastfeed will not affect her future breast shape one way or another. Heredity plays a large role in this matter, as does excessive weight gain or loss. Reality: The size of your breasts, either large or small, has nothing to do with the amount of milk they will produce. Almost all women who are getting plenty of liquid, adequate rest and relaxation, and lots of physical contact with their babies will produce enough milk. In fact, many women who believe they are not producing enough milk are mistaken. It is surprising how much milk a tiny baby can consume in a short amount of time. The number of wet and soiled diapers being produced every day is a fairly accurate indicator of how much milk the baby is getting. 6-8 wet cloth diapers (5-6 soaked disposables), and at least 2-5 bowel movements per day indicate that your baby is getting plenty of milk. Once the newborn stage is over, the number of bowel movements may decrease. Myth #3: Breastfeeding influences a baby's future sexual orientation. Reality: Not true. The misconception that breastfeeding could in some way determine whether a child will grow up to be heterosexual or homosexual is tied to the mistaken idea that breastfeeding is in itself a sort of sexual activity. It is not. Breastfeeding is a nutritional and nurturing act that help children grow up to be healthier and more self-confident, whatever their sexual preference turns out to be. Myth #4: Today's artificial breast milk is just as good as the real thing. Reality: Even though modern formulas are considerably better than some of the old fashioned ones, they can never replicate mother's milk. In the first place, human milk contains live cells and human hormones that are impossible to obtain from the milk of another species. Furthermore, formula companies admit that they don't yet know all of the ingredients in human breast milk. Every few months these companies come up with something different to try to add in. 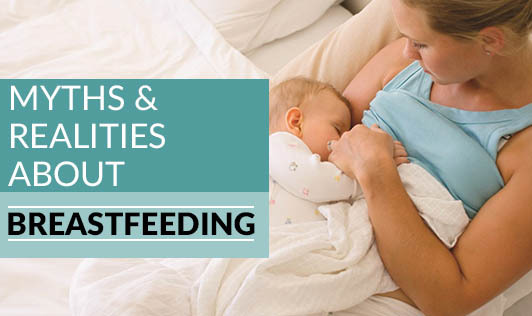 If you choose to breastfeed you can be confident that all the necessary nutrients, immunities, hormones and as yet undiscovered beneficial elements will be present in the right amounts. On the other hand, research shows significant risk in the use of artificial milk. Myth #5: You can't breastfeed after a caesarian section birth. Reality: It is entirely possible to breastfeed after a c-section. Many women describe really enjoying being able to perform this natural act after going through a very medically oriented birth. It is important to nurse in way that does not put pressure on the incision sight. The "football hold" position is particularly helpful, as is a good nursing pillow. Ask the hospital staff for help, and consider calling a lactation consultant.